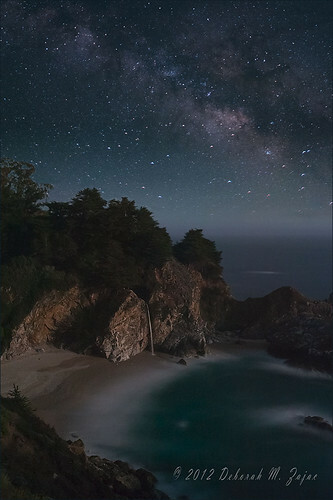 Big Sur Milky Way, originally uploaded by dmzajac2004-. I saw Steven Christenson’s beautiful photograph of the Milky Way over this fall and knew I wanted to photograph it myself. Some friends and I met to go make our own photograph of it. We arrived about 11:30pm and shot the foreground while the Moon was shining brightly and lit up the fall and beach. Then we waited for the Moon to set and the Milky Way to rise. It was a beautiful night. We couldn’t have asked for better weather. The fog stayed far out at sea and there was no wind, and it wasn’t too cold.We left for home after 3AM and I walked in my door shortly before 6AM. It was a fun, star filled night that I would do again in a heartbeat! I spent a lot of hours teaching myself how to blend these two exposures together. I found it tricky to get the horizon where it’s naturally brighter; more so this night due to the moon, to blend with the much darker night sky which I photographed hours later to graduate from light to dark and look natural. A person with more knowledge and skill with all the tools and power in Photoshop would have probably processed it in no time. I thought about archiving this folder so many times, but I’m stubborn and kept trying new things. Finally, and many layers later I am happy with the photograph. I’ve learned a lot and have a new skill or two with both Lightroom and Photoshop. I’m hoping the next time I need to do a composite blend similar to this one it’s a bit easier and a lot faster process.